A crude but effective online service that lets users deploy keystroke logging malware and then view the stolen data remotely was hacked recently. The information leaked from that service has revealed a network of several thousand Nigerian email scammers and offers a fascinating glimpse into an entire underground economy that is seldom explored. 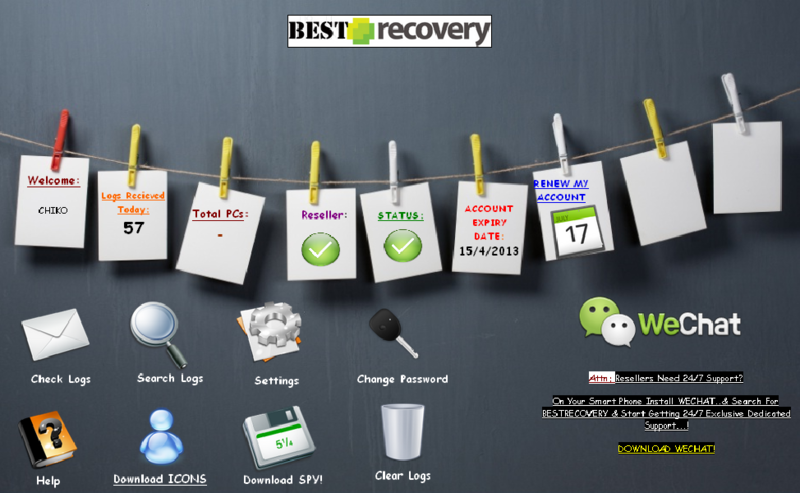 The login page for the BestRecovery online keylog service. 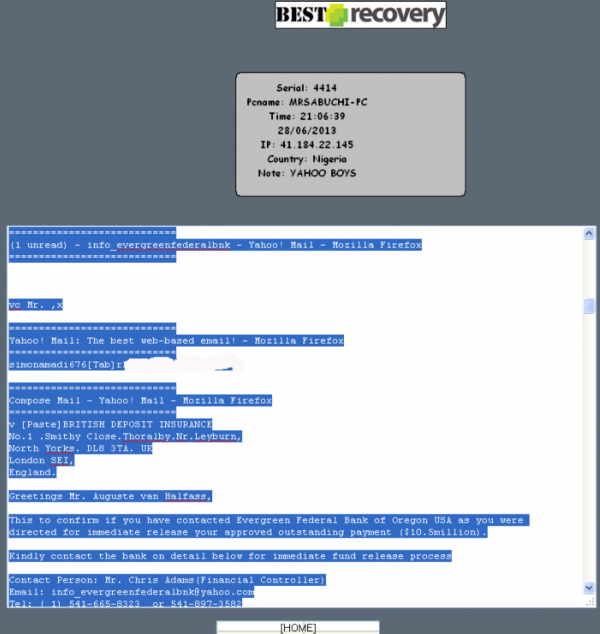 At issue is a service named “BestRecovery” (recently renamed PrivateRecovery). When I first became aware of this business several months ago, I had a difficult time understanding why anyone would pay the $25 to $33 per month fee to use the service, which is visually quite amateurish and kludgy (see screenshot at right). But that was before I shared a link to the site with a grey hat hacker friend, who replied in short order with the entire username and password database of more than 3,000 paying customers. Initially, I assumed my source had unearthed the data via an SQL injection attack or some other database weakness. As it happens, the entire list of users is recoverable from the site using little more than a Web browser. The first thing I noticed upon viewing the user list was that a majority of this service’s customers had signed up with yahoo.com emails, and appeared to have African-sounding usernames or email addresses. Also, running a simple online search for some of the user emails (dittoswiss@yahoo.com, for example) turned up complaints related to a variety of lottery, dating, reshipping and confidence scams. The site was so poorly locked down that it also exposed the keylog records that customers kept on the service. Logs were indexed and archived each month, and most customers used the service to keep tabs on multiple computers in several countries. A closer look at the logs revealed that a huge number of the users appear to be Nigerian 419 scammers using computers with Internet addresses in Nigeria. 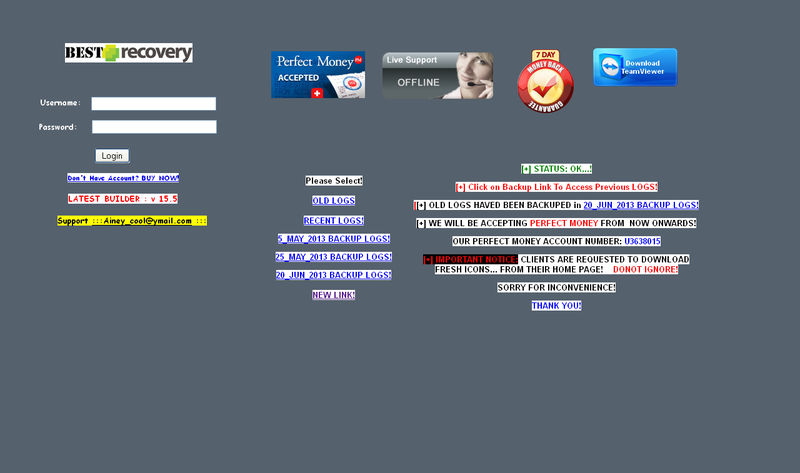 The seriously ghetto options page for BestRecovery web-based keylogger service. Also known as “advance fee” and “Nigerian letter” scams, 419 schemes have been around for many years and are surprisingly effective at duping people. The schemes themselves violate Section 419 of the Nigerian criminal code, hence the name. Nigerian romance scammers often will troll online dating sites using stolen photos and posing as attractive U.S. or U.K. residents working in Nigeria or Ghana, asking for money to further their studies, care for sick relatives, or some such sob story. The keylog records available for the entries marked “Yahoo Boys” show that Nigerian 419 scammers were just as likely to use this service as to be targets of it. Perhaps some enterprising Nigerian spammers simply infected a bunch of these cybercafe machines to save themselves some work. It is also possible that vigilante groups which target 419 scammers — such as Artists Against 419 and 419eater.com — were involved, although it’s difficult to believe those guys would bother with such a rudimentary service. 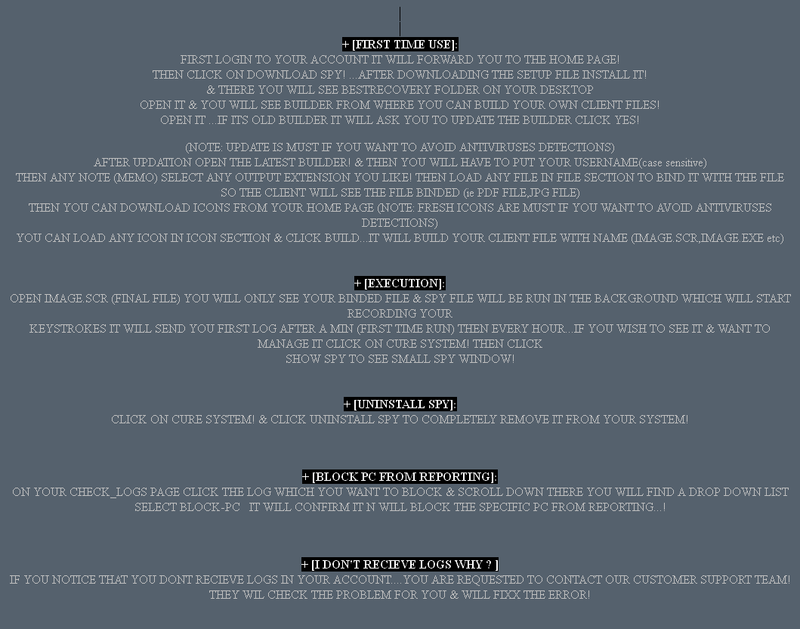 BestRecovery gives customers instructions on how to use a provided tool to create a custom Windows-based keylogger and then disguise it as a legitimate screensaver application. New victims are indexed by date, time, Internet address, country, and PC name. Each keylogger instance lets the user specify a short identifier in the “note” field (failing to manually enter an identifier in the note field appears to result in that field being populated by the version number of the keylogger used). Interestingly, many of the victim PCs have a curious notation: “Yahoo Boys”. Keylog data [partially redacted] that was apparently collected from a Yahoo Boy. BLACK HAT OR BLACK MAGIC? As noted in the above-mentioned academic paper (“Understanding Cybercrime Perpetrators and the Strategies They Employ in Nigeria”), the term “Yahoo Boys” is the nickname given to categories of young men in Nigeria who specialize in various types of cybercrime. According to that paper, in which researchers spent time with and interviewed at least 40 active Yahoo Boys, most of the cybercrime perpetrators in Nigeria are between the age of 22 and 29, and are undergraduates who have distinct lifestyles from other youths.